Not many ‘hikes’ involve glacier travel – this one does. North of Lake Louise in Banff National Park, a series of vast but gentle Icefields, known as the Wapta Icefields stretch for miles across the Great Divide of the Canadian Rockies. They provide a unique opportunity for fit walkers and hikers to enjoy natural mountain scenery that is normally reserved for mountaineers. 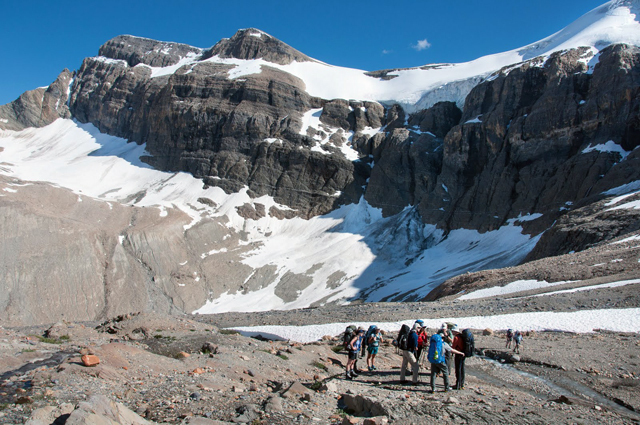 In the course of this three-day Wapta Icefield Traverse Hike, we start at Bow Lake then hike up to and over the Bow Glacier to the Peyto Glacier staying in well-equipped alpine huts en-route. If you’ve never spent any time on a glacier, its an absolutely amazing experience. 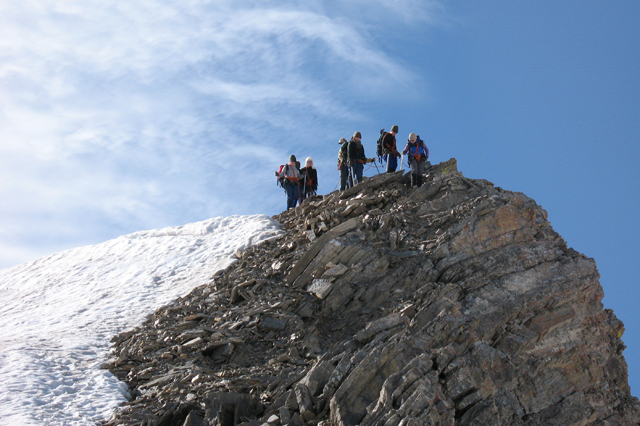 Our guides will show you this complex and fragile alpine environment in an up close and personal way. With no cell service or other modern distractions, you will be left to explore Banff National Park as it existed near the last ice age. Standing on an icefield is like being on the ocean where you’ll quickly get a sense for the vastness of the glacier. Jagged peaks pop out of the ice to stand 10,000 plus feet above sea level. 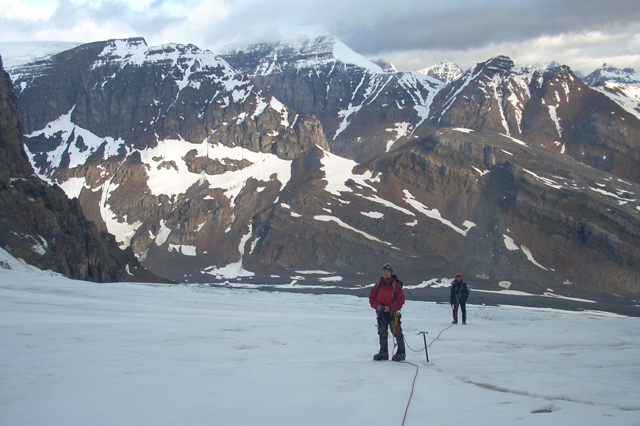 Our glacier climbing program is a surreal hiking experience. 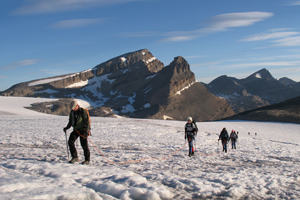 This glacier hiking tour in Banff is a Canadian Tourism Commission ‘Signature Experience’. Meet us at our office in Canmore at 8:00 am for introductions, trip review and equipment issue and check. After packing up, it’s an hour and a half drive north to Bow Lake where we commence the hike to Bow Hut. We start on the “tourist trail” which follows the lakeshore to the head of this turquoise colored lake then up the river flats beyond. The ‘tourist trail” experience finishes partway up a steep trail next to a small but spectacular gorge the river has cut into the limestone. Here the gorge is bridged by a gargantuan boulder which we use to gain the other side where the mountaineer’s trail starts. This trail leads us past old moraines then up through the forest until it opens out into a massive alpine cirque surrounded by peaks and glaciers. We hike on a rough trail through the rocky flats until a final ascent brings us to the Bow Hut which is located at 2350m on a shoulder adjacent to the snout of the Bow Glacier. The Hut has magnificent views of the surrounding peaks and glaciers as well as back down the canyon to the main valley. This will take us between 3 and 5 hours. Distance 7 km, elevation gain 400 m.
We get up early to make the most of what will be a spectacular day as we cross the Icefields to Peyto Hut. The Bow Glacier is the source of the Bow River which flows down valley through Lake Louise, Banff, Canmore and finally out onto the plains then past Calgary to eventually join the south Saskatchewan River. Today we climb its gentle slopes below the impressive crag of Mt. St. Nicholas to top out on the flat expanse of the Wapta Icefield. After a side trip to flat-topped Polaris Peak from where we gain can enjoy an expansive panorama with peaks in every direction, we continue west to where the Peyto Glacier drops gradually away. Peyto Hut sits on a bench above the Glacier where it takes a sweeping turn to the north. This is a fantastic spot, in every direction are glaciated peaks and colors in shades of rock and ice. Hiking on the glacier we will be wearing a harness and be roped together for maximum safety. The glacier, like those everywhere, has many crevasses and whilst most are easily seen and avoided, we take maximum precautions. 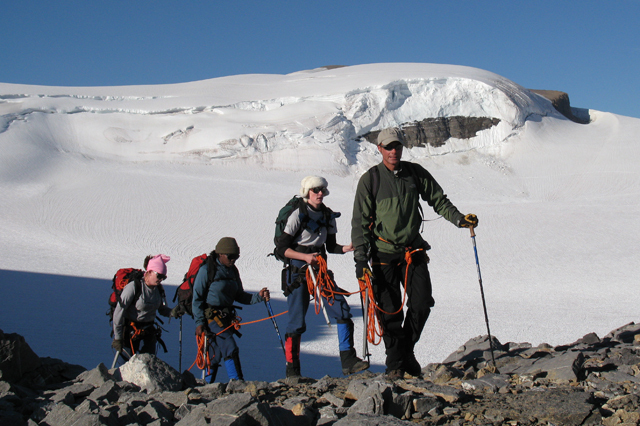 Your guide is certified, trained and very experienced on glacier terrain. We will also wear crampons (spikes that fit onto the soles of our boots) to give us firm traction on the ice. The glacial surface is not very steep. Walking with the crampons on is very easy. This will take between 4 and 6 hours. Distance 6 km. Elevation gain 550 m, loss 460 m. Additional hiking may be available depending upon conditions. It’s mostly down hill today as we drop back down to the Glacier from the Hut and follow it almost to its snout. Hiking on mostly white ice we pass mill wells down which glacier streams drop noisily into the bowels of the ice. We will see how glaciers preserve elements of the past, the exposed ice being hundreds of years old and bringing not only rocks to the surface but also spruce needles and twigs from long ago fires and the occasional bird or rodent long ago caught on the ice by early winter snows. It is usually hard to visualize the effects of global warming, not so on the Peyto Glacier which is in full retreat. Your guide will be an excellent resource to show you where the glacier was only recently. Opportunities to see glaciers up close may not be as abundant in the future. Come experience this amazing phenomenon like few people ever do. We leave the Glacier just before the snout and climb a short distance on old moraines to a rather ramshackle research station from which research on glacial retreat is sporadically carried out. From here we traverse to the top of the lateral moraine which descends into the lower valley. Back to the main trail we now start down the moraine wall track which leads us down into the lower valley. 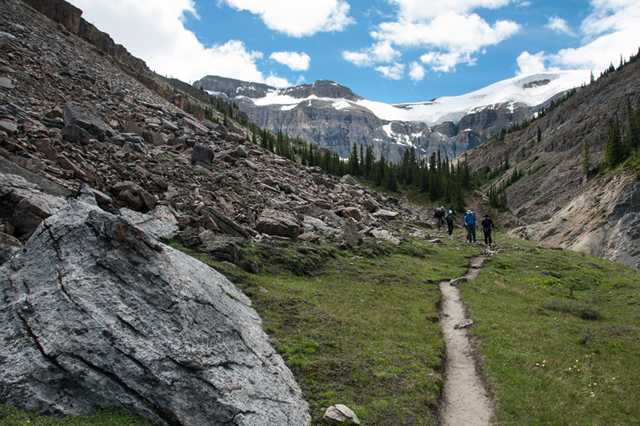 We follow river flats and a bit of forest until we reach the gravel flats above Peyto Lake. One of the signature lakes of the Canadian Rockies with its beautiful turquoise waters, Peyto Lake marks the end of our traverse. From its shores we hike up through mature forest to where we suddenly emerge once more on a “tourist trail” it being the paved path taken by thousands of tourists as they hike to look over Peyto Lake. They will ubdoubtedly be envious of what you just experienced. **Depending on conditions and water levels in the creek it may be necessary on Day 3 to retrace our steps across the icefields and back out to Bow Lake. Because this hike takes place on glaciers your guide will be a certified guide who is trained and qualified to lead you across glaciers. Our guides are also licensed by Parks Canada. Minimum group size will be 4 people. There will be a maximum of 8 guests per guide. We will meet you at our Yamnuska Mountain Adventures office at 8:00 am the morning of Day 1. Our office is located at 200, 50 Lincoln Park, Canmore. See this map for location. For your greater convenience we offer a pre-meeting shuttle service within Canmore. Please let us know in advance where you will be staying if needing this service. Pickup will occur between 7:30 and 7:50 am. Please ensure that you have your hiking equipment with you. Participants are responsible for their own transport to Canmore which is a 1 hour (100 km) drive west from Calgary. Frequent shuttles connect Calgary International Airport and Canmore. Banff Airporter is the best way to get between Calgary Airport and Canmore/Banff. When you book with Yamnuska Mountain Adventures you will receive a 15% discount on Banff Airporter Scheduled Services. We will supply transportation from Canmore to the trailhead. 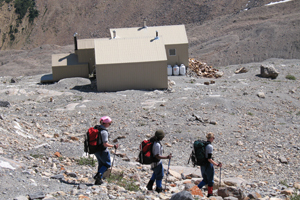 During the trip we stay in alpine huts operated by the Alpine Club of Canada. Sleeping areas are communal and facilities basic. The Huts are equipped with propane stoves, pots, pans, plates and cutlery. There is no running water. We gather water from nearby streams and lakes for drinking, cooking and washing. We supply all meals and trail snacks from lunch on Day 1 to lunch on Day 3. Trail cuisine is constructed from lightweight ingredients including our Yamnuska custom-made dehydrated dinners. For guests with dietary restrictions, we are able to modify the program food pack to meet your individual needs. As food pricing and preparation for these diets is more costly, we have implemented the following surcharges. For vegan, gluten free, lactose free, soy free, nut free or any similar type of single restriction menu requests there will be a $16/day surcharge. For a diet requiring any 2 restrictions a $25/day surcharge will apply. For any 3 restrictions a $30/day surcharge will apply. Vegetarian meals will not be surcharged. For more complex diets our kitchen staff will assess the restrictions to inform you if the diet can be accommodated and what surcharge would apply. The equipment and clothing you bring to this course will play a large role in the quality of your experience. Read the following suggestions and lists carefully. If you have any questions or need clarification, don’t hesitate to call or email. *These items are available for rent. Please advise us in advance. 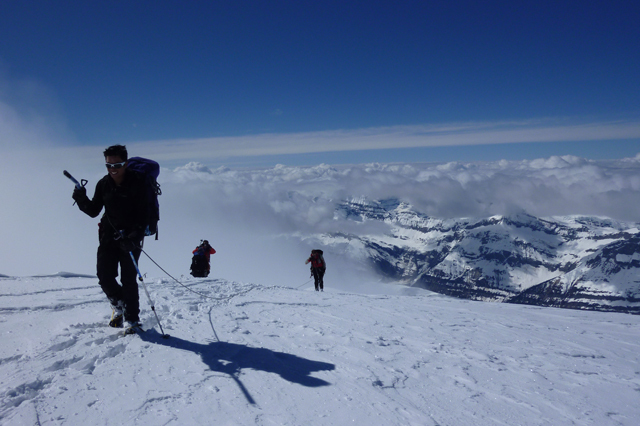 When travelling at altitude or on a glacier, it is important to be able to adjust for the changing conditions. We recommend bringing clothing that can be layered to achieve comfort as you change from periods of activity to periods of rest. Cotton clothing is not appropriate as it causes rapid heat loss when wet. Boots: A good pair of boots is essential. They need to be warm and crampon compatible. Boots either need rigid sole supported by a full length shank or boots that have a semi rigid sole supported by ¾ length shank. You are welcome to try the Scarpa Mont Blanc boots that Yamnuska rents. Crampons: Mountaineering crampons should have anti snow-balling plates, and need to be compatible with your boots. We use the Petzl Vasak. Mountaineering ice axe: Your ice axe should be 55-75 cm, and should be equipped with an adze. Yamnuska provides the Petzl Summit Axe. Climbing harness: Should be sized to fit over your cold weather clothing. It is recommended to have a harness with a belay/rappel loop. Helmet: A comfortable, all around climbing helmet that can fit over your winter hat. Please book as early as practical to avoid disappointment. A 35% deposit (including GST) is required at time of booking. Final payment is due eight weeks before the start of the trip. We accept Visa, Mastercard, Canadian Cheques, Money Orders and Bank Drafts. Credit card payments are easiest, especially for international travellers. We ask that you familiarize yourself with our detailed booking instructions and conditions. For all your travel insurance requirements we recommend the Simpson Group. This agency offers a wide range of travel insurance options including Trip Cancellation/Interruption, Travel Medical and Personal Effect Loss for Canadian Travelers. We highly recommend purchasing this insurance. Includes guides, hut accommodation, meals, mountaineering gear, Park ‘Wilderness Pass’ and local transfers. Not included: Canmore accommodation, Gratuities & 5% Goods and Service Tax (GST). This program is suitable for those with prior hiking experience. Being in good shape already will add to your enjoyment of the trip. 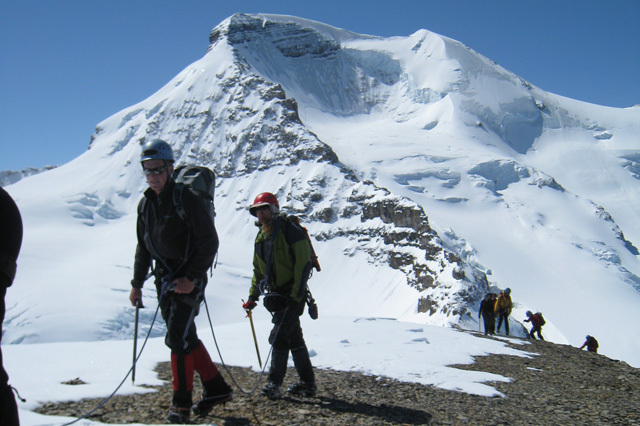 While we will be on glacier terrain often associated with mountaineering, you don’t need any mountaineering experience. You will be using basic equipment which your guide will show you how to use. Your guide will also show you how to walk on the glacier and will explain and interpret the terrain for you. 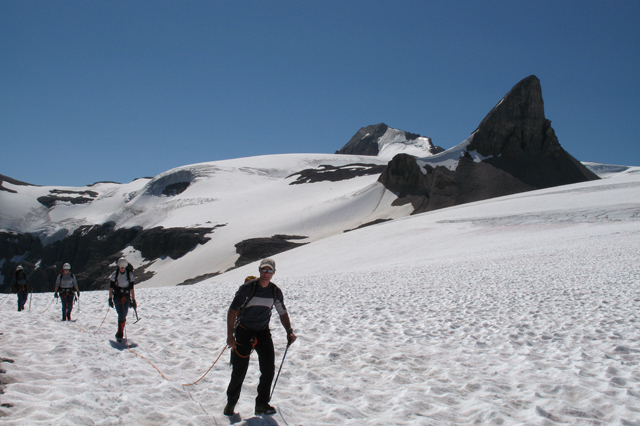 However, expect to wear crampons and be ‘roped up’ when hiking the glacier. You need to have some confidence in your hiking skills as the hardest hiking is actually below the glaciers where we will travel on trails that are often rough and rocky. However there is no technical climbing of steep ice or rock slopes involved. You will be carrying a backpack with your personal gear and a share of the group’s food. 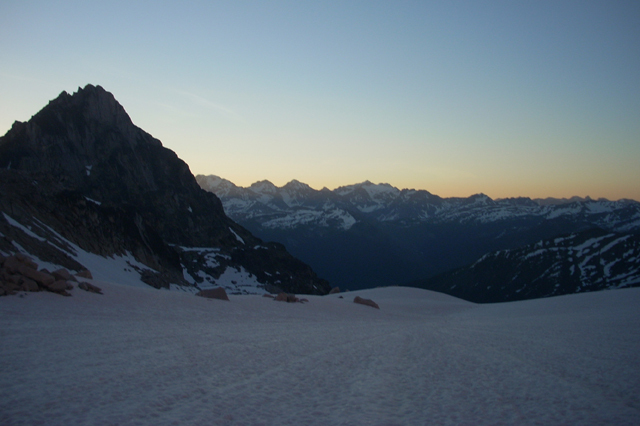 On the initial approach and on the final part of day 3 you will also be carrying your harness and crampons. The pack will likely weigh around 30 lbs (15 Kg) when we start.